The effects alter the instrument sound by clipping the signal, which adds sustain and harmonic and inharmonic overtones, leading to a compressed sound that is often described as “warm” and “dirty” depending on the type and intensity of distortion used. The effects are popular with electric guitar players in the Blues, Rock, Heavy Metal and Punk Rock genres. The terms distortion and overdrive are often used interchangeably: where a distinction is made, “distortion” is used to denote a more extreme version of the effect than “overdrive”. Fuzz is a term used to describe a particular form of distortion, originally created by guitarists using faulty equipment (such as a misaligned valve tube), which has been emulated since the 1960s by a number of “fuzzbox” effects pedals. Distortion, overdrive and fuzz, can be produced by effects pedals, rackmounts, pre-amplifiers, power amplifiers, speakers and since the 2000s, digital amplifier modeling devices and audio software. These effects are used with electric guitars, electric basses (fuzz bass), electronic keyboards, and more rarely, as a special effect, with vocals. Guitar distortion can be produced by many components of the guitar’s signal path, including effects pedals, the pre-amplifier, power amplifier, and speakers. Many players use a combination of these to obtain their “signature” tone. Pre-Amplifier Distortion : The pre-amplifier section of a guitar amplifier serves to amplify a weak instrument signal to a level that can drive the power amplifier. It often also contains circuitry to shape the tone of the instrument, including equalization and gain controls. Often multiple cascading gain/clipping stages are employed to generate distortion. Overdrive/Distortion Pedals : Analog overdrive/distortion pedals work on similar principles to preamplifier distortion. Because most effects pedals are designed to operate from battery voltages, using vacuum tubes to generate distortion and overdrive is impractical; instead, most pedals use solid-state transistors, op-amps and diodes. Classic examples of overdrive/distortion pedals include the Boss OS series (overdrives), the Ibanez Tube Screamer (an overdrive), the Electro-Harmonix Big Muff Pi (a fuzz box) and the Pro Co RAT (a distortion). Typically, “overdrive” pedals are designed to produce sounds associated with classic rock or blues, with “distortion” pedals producing the “high gain, scooped mids” sounds associated with heavy metal; fuzz boxes are designed to emulate the distinctive sound of the earliest overdrive pedals such as the Big Muff and the Fuzz Face. Power Amplifier Distortion : Power valves (tubes) can be overdriven in the same way that pre-amplifier valves can, but because these valves are designed to output more power, the distortion and character they add to the guitar’s tone is unique. 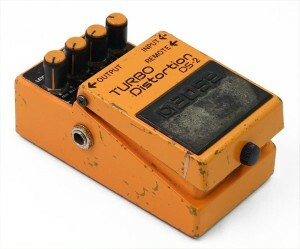 During the 1960s to early 1970s, distortion was primarily created by overdriving the power valves. Many valve-based amplifiers in common use have a push-pull output configuration in their power section, with matched pairs of tubes driving the output transformer. Power amplifier distortion is normally entirely symmetric, generating predominantly odd-order harmonics. Output Transformer Distortion : The output transformer sits between the power valves and the speaker, serving to match impedance. When a transformer’s ferromagnetic core becomes electromagnetically saturated a loss of inductance takes place, since the back E.M.F. is reliant on a change in flux in the core. As the core reaches saturation, the flux levels off and cannot increase any further. With no change in flux there is no back E.M.F. and hence no reflected impedance. The transformer and valve combination then generate large 3rd order harmonics. So long as the core does not go into saturation, the valves will clip naturally as they drop the available voltage across them. In single ended systems the output harmonics will be largely even ordered due to the valve’s relatively non linear characteristics at large signal swings. This is only true however if the magnetic core does not saturate. Power Supply “Sag” : Early valve amplifiers used unregulated power supplies. This was due to the high cost associated with high-quality high-voltage power supplies. The typical anode (plate) supply was simply a rectifier, an inductor and a capacitor. When the valve amplifier was operated at high volume, the power supply voltage would dip, reducing power output and causing signal attenuation and compression. This dipping effect is known as “sag”, and is sought-after by some electric guitarists. Sag only occurs in class-AB amplifiers. This is because, technically, sag results from more current being drawn from the power supply, causing a greater voltage drop over the rectifier valve. In a class-A amplifier, current draw is constant, so sag does not occur. Speaker Distortion : Guitar loudspeakers are designed differently from high fidelity stereo speakers or public address system speakers. While hi-fi and public address speakers are designed to reproduce the sound with as little distortion as possible, guitar speakers are usually designed so that they will shape or colour the tone of the guitar, either by enhancing some frequencies or attenuating unwanted frequencies. Amp Modeling for Distortion Emulation : Guitar amp modeling devices and software can reproduce various guitar-specific distortion qualities that are associated with a range of popular “stomp box” pedals and amplifiers. Amp modeling devices typically use digital signal processing to recreate the sound of plugging into analogue pedals and overdriven valve amplifiers. The most sophisticated devices allow the user to customize the simulated results of using different preamp, power-tube, speaker distortion, speaker cabinet, and microphone placement combinations. Increasing the bass and treble while reducing or eliminating the centre midrange (750 Hz) results in what is popularly known as a “scooped” sound (since the midrange frequencies are “scooped” out). Conversely, decreasing the bass while increasing the midrange and treble creates a punchy, harsher sound.